The previously announced Blue Mage job in Final Fantasy XIV officially launched this morning, shortly after weekly resets. The Blue Mage is a special class in the game that gains new spells by witnessing and killing specific enemies throughout Eorzea. They're the first class in the game labeled as a 'limited class' as their max level is currently 50, while every other class caps at 70. Despite the Blue Mage class launching this morning, players were able to hit level 50 within an hour simply by tagging high level monsters and having their friends kill them. Unlocking all 48 blue mage spells though takes time and requires running old content. Blue mage is the first limited job in FINAL FANTASY XIV. As such, there are several key points that distinguish it from other jobs. Blue mage functions independently of other classes and jobs, starting at level 1 with a maximum level of 50. 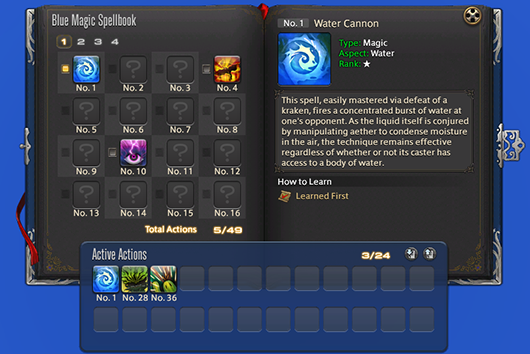 * It is not possible to change to blue mage after entering the instance. * It is possible, however, to enter the Wolves' Den as a blue mage. Blue mages gain greater experience from battling enemies in the open world than other jobs do. * No bonuses are granted to experience gained from FATE or guildleve enemies. Blue mage cannot be used to progress through the main scenario. Retainers cannot be assigned the blue mage job.